Employers should never place particular items in your general personnel records. The contents of your employee personnel files and records are generally accessible to Human Resources staff, the employee, and the employee’s manager or supervisor, in some companies. In others, access is limited to HR staff and employees can request access to their records. Lawyers can also subpoena the contents of the personnel records for lawsuits and the Equal Employment Opportunity Commission (EEOC) complaints. A former employee can also request a copy of his or her personnel records. Best practice makes the personnel file only accessible by Human Resources staff members. You need to keep personnel files under lock and key in a storage area that makes them inaccessible to other employees. With all of these potential uses and potential viewers of your employee personnel records, an employer must take care to maintain unbiased, factual documentation of an employee’s employment history in your employee personnel records. Consequently, you will want to apply these general guidelines to the documentation that you retain in your organization’s personnel records. Information in personnel records must be factual. Supervisor or Human Resources staff opinions; random notes; gossip; unfounded rumors; questions, reports, or tattletale allegations from other employees that are unexplored; allegations not pursued, investigated, and concluded; and any other non-factual information, commentary, or notes should be excluded from an employee's personnel file. One of the worst examples of offensive commentary that an HR manager found filed in an employee personnel record, involved a hiring manager’s interview notes. One stated: “Possibly too fat to get up and down the stairs as needed.” Imagine the employee, an attorney, and even future employees and supervisors reading comments such as these. In another company, the manager found unsubstantiated notes that managers and others had placed in the employee's files such as, "Mary's angry because she didn't get a raise. She slowed her work down purposefully to get even with her manager." See the problem? Personnel records must be thoughtfully assigned to their appropriate file locations. Determine a protocol for your company personnel records based on state and Federal laws, employment laws such as the Health Insurance Portability and Accountability Act of 1996 (HIPAA), and employer best practices. Then, stick with the protocol. You do not want to find random doctor’s excuses tucked into the personnel file when they belong in a medical file. Nor, do you want the rationale and justification for an employee’s promotion in the payroll file. You also don't want the records of a hiring decision that involve background checking or notes from discussions with former employers in the personnel file. Supervisors, managers and other employees who place documentation in personnel records need training. Any person who has access and can place documents in an employee personnel file needs training to appropriately write the documentation. Stating in an employee reprimand that the employee was a complete deadbeat won’t win your personnel records any prizes. But, untrained supervisors have been known to write similar statements and place them in employee personnel files. Better yet, limit access to the files to your HR staff person who is responsible for the records and knows what should and should not be placed in a personnel file. Balance the information you place in personnel records. Include both the positive and the negative aspects of an employee’s employment history. Too often, personnel records emphasize every negative occurrence and miss the positive components that every employee experiences. Think raises, promotions, excellence rewards, and copies of praise and thank you notes. Recognize the difference between a supervisor’s personal notes about their reporting staff and the official company personnel records. The supervisor’s notes that are used for performance improvement, to track projects and goal completion, and to fairly determine raises and performance development plans, for example, belong in a supervisor’s private file, not in the company’s official personnel records. Recognize, too, the need to train supervisors in how to take notes and maintain documentation in their management file. The same criteria for facts, not opinions, and specific examples, not hearsay, apply to private notes. The supervisor's private notes can be subpoenaed in the instance of a lawsuit, so caution is recommended even for private notes. The practice of supervisors keeping copies of records that exist in the official employee personnel file in their management file is not recommended. Hiring documentation and interview notes present a bit of a quandary. The best practice is to maintain a separate file for each position you fill that includes all of the documentation related to filling that position from the job posting to the reference checks. The applicants' resumes, cover letters, and applications belong in this file except that you should move the hired employee's application to the employee personnel file. This file has the official checklists and forms that strive for unbiased representation of a potential employee’s qualifications and support your decision to hire the most qualified candidate. The hiring manager’s opinions and notes that were taken during the hiring process do not belong in this file. Human Resources may collect these notes to maintain complete documentation on an employment decision, but they do not belong in the personnel records. Factual documentation about employment decisions. This documentation includes such decisions as promotion, transfer to a lateral opportunity, and salary increases and they belong in the personnel records. The supervisor’s or HR’s opinions about the employee do not. Official disciplinary action documentation such as a written warning also belongs in the employee's personnel file. The following information should not be placed in personnel records. The documentation may require a separate file, may be classified as supervisory or management notes, or should not be kept at all by an employer. Any medical information belongs in the medical file. Payroll information belongs in the payroll file. Documents that include employee social security numbers or information about an employee's protected classifications such as age, race, gender, national origin, disability, marital status, religious beliefs and so forth should never be kept in the personnel files. Supervisory documentation for the purpose of managing an employee’s work, setting goals, feedback provided and so forth should be filed in a private, supervisor or manager-owned folder. Investigation material including the employee complaint, witness interviews, employee interview, findings, attorney recommendations, and resolution, plus follow-up to ensure no retaliation, should reside in an investigation file that is separate from personnel records. File employee I-9 forms in an I-9 file or location, away from employee personnel records. Place background checks including criminal history, credit reports, and so forth, and the results of drug testing in a separate file that supervisors, managers, and the employee cannot access. SHRM recommends either this separate file or recommends that this information may also be filed in the employee's medical file. Employee Equal Opportunity records such as self-identification forms and government reports should not be kept in the personnel file nor anywhere the supervisor has access. 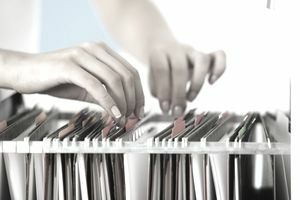 If you follow these guidelines, your organization is effectively storing factual, supportable employment history and personnel records in the appropriate locations.